UPDATE: Missing Pasadena Man Found Dead in L.A.
You are at:Home»English»Community News»UPDATE: Missing Pasadena Man Found Dead in L.A.
A 71-year-old Pasadena man with Alzheimer’s disease was found dead on Monday in Los Angeles, two days after he was reported missing. 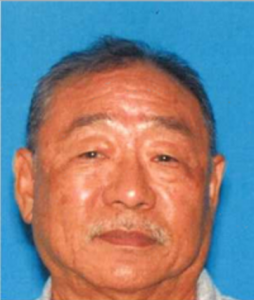 According to the Pasadena Police Department, there “does not appear to be any obvious signs of foul play” in the death of Gerald Masao Sakamoto, a husband, father and grandfather, who was last seen alive near Downtown Los Angeles. The department and Sakamoto’s family circulated his photo over the weekend, seeking the public’s help to find him. The story was carried by local media, including The Pasadena Star News and ABC7 Eyewitness News, and was widely shared on Facebook. Sakamoto was arrested by the California Highway Patrol in the San Gabriel Valley on Friday around 3 a.m. on suspicion of DUI following a crash. He was booked at the Inmate Reception Center (IRC), 450 Bauchet St. near Union Station in Los Angeles, at 8:02 a.m., and released at 7:36 p.m., according to the Los Angeles County Sheriff’s Department. His family said he had no money and no phone at the time. His body was found by an LAPD officer in a nearby maintenance yard in the 500 block of Ramirez Street, less than half a mile from the IRC. His wife of 49 years, Jane, said the family was concerned about his safety. “I know there’s good people out there, but there’s also people that you shouldn’t trust. I don’t think he’d know the difference at this time,” she told ABC7. Sheriff Jim McDonnell told CBS Los Angeles that Sakamoto showed no signs of “distress or disorientation” in security footage reviewed by the department. “Jerry (Gerald) Sakamoto was a good man who loved his family and his country. He was always willing to give a helping hand and never made you feel bad about asking for it. Dad was an honest, caring, and fair man who never tried to take advantage of another. He was generous and thoughtful like his parents before him. On Monday morning, the family was working with the IRC to get images of Sakamoto at the facility so that flyers could show what he was wearing when he went missing. Early Monday afternoon, the family received the bad news. An autopsy was pending. The fatality was reminiscent of the death of 24-year-old Mitrice Richardson, whose skeletal remains were found in a remote canyon in August 2010 nearly a year after she had been released from the sheriff’s Lost Hills/Malibu station. She had been arrested at a Malibu restaurant the night of Sept. 16, 2009, for failing to pay her bill. She was released from the sheriff’s station early the next morning without her car, telephone or purse. Her parents sued the county, claiming deputies should not have released their daughter into the night, given her mental state. The young woman may have been manic at the time of her arrest. A diary recovered from her car, which had been seized because deputies found some marijuana in it, suggested that she may have gone without sleep for as many as five days before her arrest.